With DC being one of the hottest real estate markets in the country, it's common for buyers to find themselves competing with other buyers for the same home. One of the most common strategies used is the escalation clause. WHAT IS THE ESCALATION CLAUSE? An escalation clause is an optional part of an offer stating the buyer will increase their offer by X amount over a higher bid — but usually no higher than a stated amount (the cap). The clause is triggered by a competing offer, and can be a way to beat out the competition. Here's an example: If Buyer 1 puts in an offer of $750,000 on a home priced at $750,000, and Buyer 2 offers $751,000, Buyer 2 should get the house, right? Well, not if Buyer 1 has an escalation clause increasing her offer to $2,000 above the highest bidder up to a cap of $775,000. In the aforementioned case, Buyer 1 would get the house for $753,000. An escalation clause can move up in various increments, usually ranging from $1,000 to $5,000. No changes are made to the loan, and the buyer makes up the difference in cash. The loan automatically applies to the new amount, assuming that the borrower is approved for 75 percent of the final sales price. The loan covers some of the difference between the asking price and final sales price, and the buyer will pay the difference between the loan and the purchase price at settlement. HOW DO YOU KNOW IF THERE WAS ACTUALLY ANOTHER OFFER? The escalation clause contains language that allows the winning bidder to get proof of the other offer. This is typically done by providing a copy of the first page of the other offer's contract, and/or their escalation clause. Once you have proof of the other offer and receive the final sales price, the winning buyer must provide the final signature to officially go under contract. At-Large Councilmember Elissa Silverman introduced a bill on Tuesday that would increase penalties for landlords who refuse to rent to people who use federal rental assistance vouchers (previously called Section 8 vouchers) to pay their rent. While it’s already technically illegal for landlords to discriminate against renters based on their “source of income,” discrimination in housing ads remains rampant in the District. A WUSA9 investigation found more than 100 Craigslist ads in the District with language like “No housing vouchers” or “Vouchers not accepted” written plainly in the description of housing ads. In response, the D.C. Attorney General’s office sued two affiliated real estate companies in the District for allegedly discriminating against recipients of housing vouchers in their rental process. Silverman’s bill would increase penalties for any landlord who violates the D.C. Human Rights Act and “advertises their intent” to discriminate against housing voucher holders. The legislation would require the payment of a fine to the Office of Human Rights—$10,000 for the first violation, $15,000 for the second, and $20,000 for every subsequent violation, according to the text of the bill as introduced. At-Large Councilmembers David Grosso and Anita Bonds, Ward 1 Councilmember Brianne Nadeau, Ward 2 Councilmember Jack Evans, and Ward 6 Councilmember Charles Allen co-introduced the measure, and the bill currently has the support of a majority of the D.C. Council. How Much Can You Make From A DC Condo Conversion? UrbanTurf spoke with a few local real estate consultants whom offered an example of the itemized expenses and profits for small condo projects. Although profitable home-flipping in DC has been associated with more affordable neighborhoods in recent years, converting a single-family home into condos remains profitable for developers willing to put in a hefty upfront investment. 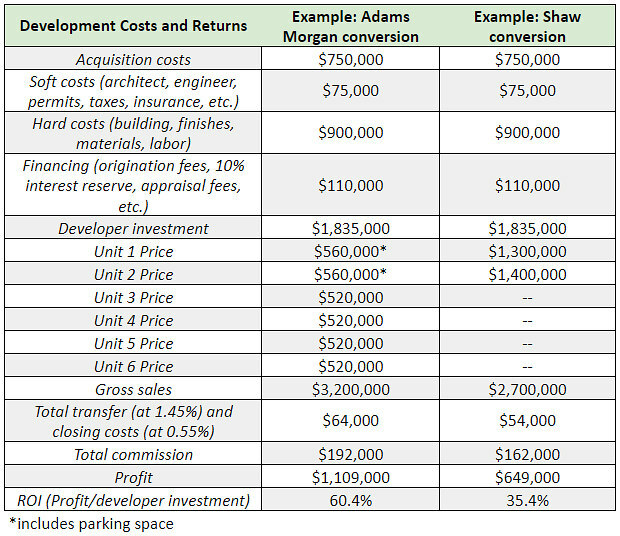 The table below compares conversions in Adams Morgan and the Shaw Historic District. The Adams Morgan example is for converting a 4,000 square-foot stacked flat into six condo units. In this case, the site is zoned RA-2, is not in a historic district and requires two parking spaces. The Shaw example is for conversion of a 4,000 square-foot single-family home into a pair of flats. This example is also on an RF-1 zoned site within the Shaw Historic District, and no parking is required. The familiar faces of your neighborhood police officers might be changing: the Metropolitan Police Department has officially instituted its new district boundaries, which it first announced last year. The city is split into seven different police districts, which are themselves made up of several “police service areas.” Every five to seven years, the department assesses its workload across districts and takes a look at future population estimates to make any necessary changes to district boundaries and PSAs. All seven districts will see some kind of change, but a few larger neighborhoods are bearing the brunt of the shifts. Mount Pleasant is going from the Fourth District to the Third (which actually puts it back where it was before the 2012 boundary changes); Park View is moving from the Third District to the Fourth; Fairlawn will move from the Seventh District to the Sixth; some parts of Capitol Hill and H Street will move from the First District to the Fifth District; Truxton Circle and Bloomingdale are moving from the Fifth District to the Third; and a chunk of downtown, including City Center, will move from the First District to the Second. You can see detailed drawings of the new district and PSA boundaries in this slideshow from MPD. The changes are meant to create “optimal availability of police resources” across all districts, MPD says. The department is also taking into account population projections in drawing its new boundaries. The city recently hit 700,000 residents for the first time since 1975, and it’s projected to keep growing, reaching almost 850,000 by 2030. Customers trickle in, grabbing six-packs out of the fridge in the corner or getting growlers of beer filled to take home for the holiday. Chris Olson of Brookland stops in to replenish a pair of 64-oz. DC Brau opened in 2009 as the first business to brew, package, and distribute its beer in D.C. proper in more than five decades. Additional breweries followed, and with them came distilleries, cideries, and other craft alcohol producers. These businesses have sprung up along Rhode Island Avenue and just across the train tracks on Bladensburg Road and New York Avenue, many of them in old warehouses and industrial spaces. They’re joined by City Winery and, down the street in the Arboretum neighborhood, Supreme Core Cider. Beyond a bit of healthy competition, the concentration of booze makers has also fostered a sense of unity, according to the roughly half a dozen brewers and distillers who spoke with DCist. Franklins laid the groundwork for the downtown areas craft alcohol scene more than a decade ago. Owner Mike Franklin opened a general store in 1992, and was ahead of his time in selling a variety of craft beer for off-site enjoyment. Franklin says “Maryland Sen. Paul Pinsky, (D-Prince Georges), sponsored state legislation to allow for a liquor license in a specific area of Hyattsville, located in his district that would allow retail businesses to also sell beer made on-site”. The brewpub owner says “the development of Hyattsville’s arts and entertainment district eventually helped to draw other producers, including Vigilante Coffee Co. Streetcar 82 Brewing Co, a deaf-owned operation, began serving this summer and held its grand opening in September”. Ken Carter, owner of Maryland Meadworks and a longtime Franklin’s patron officially opening Maryland Meadworks in October. It was a “conundrum” when DC Brau opened in 2009, DC Brau co-founder Brandon Skall recalls. “We were able to sell beer to-go to people, but couldn’t sell them beer for here, and we couldn’t even let them taste beer from here,” he says. Harry Thomas Jr., who introduced the Brewery Manufacturer’s Tasting Permit Amendment Act of 2011, which would enable production breweries to serve small samples on-site. Three years later, the council expanded that freedom to allow breweries to sell and pour pints. Thomas successor Kenyan McDuffie has carried the torch in his ward, which includes most of the city’s alcohol makers. ISkall of DC Brau and John Uselton, co-founder of Green Hat Gin maker New Columbia Distillers, both say “the arrival of peers in the industry has made it easier to lobby successfully to change the rules for what they can do”. When New Columbia first opened in 2012, it was the first spirits maker to open in the District post-Prohibition. It was tougher to get lawmakers ears as the city’s lone distiller, Uselton co-founder of Green Hat Gin maker new Columbia Distillers says. “Once we got a couple of distilleries, we were really able to get our voice heard by Council”. “There’s now more than half a dozen in the District, and that’s brought some sense of camaraderie among most of them”, Uselton says. The entrepreneurs there have arrived amid a wave of development driving up property values and bringing new residential and retail investments to a historically black, low-income neighborhood.